The night my son drove me back to the coast after our family trip for Christmas in southern Idaho, we drove straight into the wind and rain coming in from the ocean. The closer we got, the more it came down. Once again I was grateful for my son’s skill at driving on wet surfaces, dark surfaces, icy surfaces. More than once he had literally steered our little band of humans and dogs safely away from disaster. The storm continued for the next two days after I was driven got home. The huge trees were getting tossed around like wet mops. The ocean tossed piles of foam up our access steps. Our outings were brief in between dedicated downpours and not unlike when Pooh and Piglet get buffeted around on a “blustery” day. In fact, “blustery” would be a polite way to describe it. So it was with relief on the third morning that day broke quiet and light poured out over the winter horizon. It was, curiously and beautifully, a white light, not a rosy or yellow dawn. But it was so beautiful I could not get it out of my head. I immediately prepared the paper with the background sky right after seeing it so I wouldn’t forget it. Then I took a few days to work through the sketch that you see at the top of this post. About the same time, I had this idea that I would like to try making cornbread with crushed pineapple instead of applesauce or yogurt. This is because I wanted some cornbread, and I didn’t have any applesauce or plain non-dairy yogurt, which are the go-to fat replacement ingredients in Fat Free Vegan Kitchen’s Confetti Cornbread, a recipe template I have enjoyed adapting in the past with whatever I had on hand. I got quite carried away on the wings of this idea; I thought that maybe, after all these months, I might actually have a recipe post, like in the olden days before I started drawing all the time. In winter here at the coast the days are often dark and overcast. 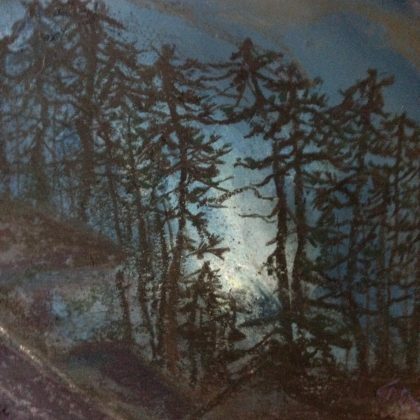 With the sun so low in the sky, the time I get to use natural light to see how my pastels are progressing is precious. And I realized then what I wanted to do most was finish this “Daybreak” pastel and start on a couple of others, not to make the cornbread. And this was okay with me. It’s important to be clear on what my priorities are. After the drawing was complete and I had a couple more in progress, I was satisfied enough that I decided I would, after all, try to make the cornbread, and perhaps write about it on the blog as an accompaniment to New Year’s Day Black-Eyed Peas. Sometimes the desire to post a recipe feels like the reflex of a ghost limb. The cornbread did not come out in a way I could call photogenic, and the tastes I used were understated. There was nothing wrong with it; it just wasn’t blog worthy in the way I had day dreamed about. That was okay, too. I ate a couple of pieces, cut it all up, and put the squares in the freezer. I considered the whole thing an object lesson that demonstrated what drives me these days is making art, not recipes. New Year’s Day came, and one of my neighbor’s invited me over for tea. I decided to surprise her with black-eyed peas, greens and my homemade spelt bread. I also brought along two of the slices of corn bread. We never got to it, so I left my neighbor one and brought the other one home. When I tasted it, the benefit of becoming more pronounced in flavor that time in the freezer often gives baked goods seemed to have kicked in. Still, I couldn’t think of any kind of word frame to provide this humble looking non-photogenic corn bread. Then, as usual, my process of inspiration surprised me. I don’t like drawing food all that much, or at least I don’t like drawing what I’m going to eat, so my transition into making more art has not resulted in illustrating my blog posts with images I draw of my own recipes , despite my sincere admiration for The Vegan Stoner. But for some reason I could not get this little square of corn bread out of my mind until I drew it. So here is the very first memory sketch of a piece of bread I made myself. 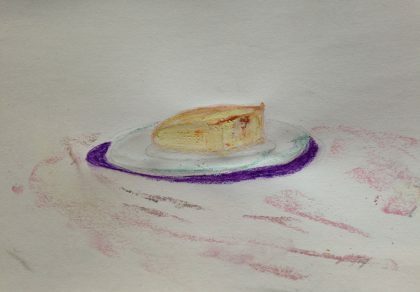 This drawing does a good job of capturing the “spirit” of that cornbread: it didn’t rise a lot, it was that kind of somewhat strange yellow color, and if you look carefully you can see a bit of orange peel I used as “confetti” instead of the red and green peppers in Susan’s recipe. It fascinates me that while I could not bring myself to photograph or draw from life one of these humble little slices, the memory of eating it, prompted this sketch. The square of cornbread is placed on a glass plate I no longer own, one that was part of a set I used for 20 years on Asbury street. So in a way the drawing is a nostalgic remembrance of that time, and the recipes I came up with to share here and photographs I took of them back when I lived in the blue house. If you’d like to try and recreate this version of Confetti Cornbread, it’s easy enough to do: follow Susan’s recipe, using chopped orange peel and bits of pineapple for the confetti. If you don’t have applesauce or plain non-dairy yogurt, whir up some crushed pineapple in the food processor like I did and sub that in. It doesn’t have quite the same texture, and is not as pronounced a flavor as the applesauce or the yogurt, so I’d also recommend putting in at least one tablespoon of the optional sugar. I used white spelt flour and cornmeal, but I’ve made Confetti Cornbread before with gluten free flour too (2/3 gluten free flour, 1/3 cup gluten free tapioca or potato starch for the cup of flour, or one cup of gluten free baking mix). It seems to me my love of recipe making and relationship to food has translated itself into the “timeless time” I spend in art, which in turn has become as indispensable to my well-being as breathing. That’s what makes this humble little drawing of a humble little piece of cornbread feel like a talisman to me. I’m not a big stickler for exactitude (in some things anyway), so if you missed your black-eyed peas, greens and cornbread on New Year’s Day, it’s still the first month in the year and in my opinion, not too late to indulge. Or if you don’t feel like cooking, at least look at some pictures of lucky food and see if it helps you feel extra lucky. I hear such pictures are worth a thousand words. I love the memory sketch of the corn bread. What a beautiful way to illustrate your recipes. Will have to try that recipe, as I love corn bread. Ditto what Pam said on the sweet cornbread sketch! Beautiful pastels. Thank you for that inspiration, and for this yummy recipe for Confetti Cornbread. I’ve never found one I liked until this one. Ate it with a red lentil chili from # LeanandClean, an online booklet with recipes. You’re welcome, Lynne! And so glad you enjoy the pastels! Love “Daybreak after a Storm.” I can’t remember when we last had rain…..ah but that’s an Adelaide summer for you. Hope it comes soon.